Deb, her husband Scott, three children, Arrin, Katie, and Taylor live in a small wooded area at the edge of Gettysburg, Ohio. Her husband and family lovingly built their Saltbox home, which is the namesake of their Folk Art Stationery line that they began in early 1995. 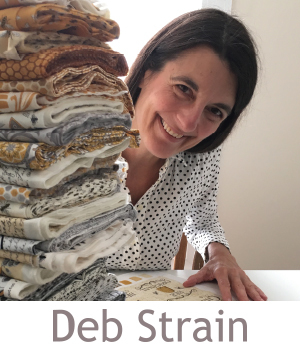 In 1996, Deb left her position as an art teacher for the past nine years to devote herself solely to her family and the development of her own art and business. "Many of my images have a folk art flavor to them, increasingly leaning toward the primitive. I have grown to love the warmth and friendliness of old quilts, gardens and Americana." Inspirations for several of her paintings have come from dolls created by Anne McKinney, an artist in her own right. Detailed images that touch a familiar heartstring or bring a quiet smile to the viewer, create the basis of her portfolio. "I am continually collecting ideas and images for my next illustration, whether it be from nature, antique shops, friends or my own imaginings. A painting is usually constructed from several scraps of ideas and then carefully pieced together to make a whole...similar to the quilts that I have come to treasure. Finally, my inspiration comes from the wonderful and loving support that is all around my life, from those in my own family, the staff in our own business and the company and the stores that I work with. I feel like I have so many people cheering me on. We truly work in a kind part of the business world, one that gives back in friendship as well as other benefits...and that is one of the most cherished qualities there is."